The national average price for regular unleaded gasoline has dropped for 12 days in a row, which is the longest consecutive decline since January. Today’s national average price is $2.70 per gallon, which is a nickel per gallon less than one week ago and seven cents less than one month ago. Most drivers are paying the lowest July prices since 2009 and are saving 82 cents per gallon at the pump compared to a year ago. • Vermont’s current price is $2.29 per gallon, which is four cents lower than one week ago, and one dollar lower than one year ago. • New Hampshire’s current price is $2.65 per gallon, which is four cents lower than one week ago and 95 cents lower than one year ago. • Maine’s current price is $2.71 per gallon, which is five cents lower than one week ago and 94 cents lower than one year ago. The slow decline in the national average is in stark contrast to regional price volatility that continues to characterize some markets, as a result of localized refinery issues and tight supplies. Pump prices have moved dramatically higher in California this month due unexpected drawdowns in supplies, shortages in the blending components used to make the state’s mandated boutique fuel and recent reports of several refineries dealing with production issues. On the other end of the spectrum, production at refineries in the Midwest is reported to have reached a 2015 high and prices have subsequently moved noticeably lower in much of the region. The global oil market touched multi-month lows to open the week’s trading session in reaction to signals that the market is likely remain oversupplied in the near term, which is expected to keep downward pressure on prices. Worse than expected economic data out of China showed growth in the country to be more volatile than anticipated, which could further increase the global glut in oil and gasoline. Domestic crude inventories grew by 2.5 million barrels in the most recent weekly report, while the number of U.S. oil rigs grew by 21, which was the largest gain since April 2014. Supply continues to outpace domestic demand, and as a result, West Texas Intermediate crude oil fell below $50 per barrel for the first time since April this past week. At the close of Friday’s formal trading on the NYMEX, WTI settled down 31 cents at $48.14 per barrel. Losses continued this morning as WTI was down in early trading to below $48 per barrel. The price of oil generally accounts for more than half the cost of retail gasoline at the pump, so lower crude oil prices typically lead to lower pump prices for motorists, barring other influencing factors like refinery issues, distribution challenges or changes in demand. Motorists can find current gas prices along their route with the free AAA Mobile app for iPhone, iPad and Android. The app can also be used to map a route, find discounts, book a hotel and access AAA roadside assistance. Learn more at AAA.com/mobile. 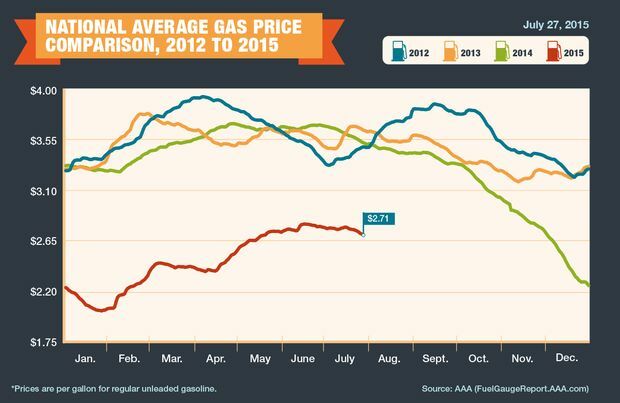 Current prices can also be found at AAA Daily Fuel Gauge Report: http://fuelgaugereport.aaa.com.